Francis Watkins was an eminent figure in his field of mathematical and optical instrument making in mid-eighteenth century London. Working from original documents, Brian Gee has uncovered the life and times of an optical instrument maker, who - at first glance - was not among the most prominent in his field. In fact, because Francis Watkins came from a landed background, the diversification of his assets enabled him to weather particular business storms - discussed in this book - where colleagues without such an economic cushion, were pushed into bankruptcy or forced to emigrate. He played an important role in one of the most significant legal cases to touch this profession, namely the patenting of the achromatic lens in telescopes. The book explains Watkins's origins, and how and why he was drawn into partnership with the famous Dollond firm, who at that point were Huguenot incomers. The patent for the achromatic telescope has never been satisfactorily explained in the literature, and the author has gone back to the original legal documents, never before consulted. He teases out the problems, lays out the evidence, and comes to some interesting new conclusions, showing the Dollonds as hard-headed and ruthless businessmen, ultimately extremely successful. The latter part of the book accounts for the successors of Francis Watkins, and their decline after over a century of successful business in central London. Recipient of the Paul Bunge Prize 2015, awarded for outstanding research in the study of scientific instruments by the Gesellschaft Deutscher Chemiker (GDCh) and the Deutschen Bunsen-Gesellschaft Physikalische Chemie (DBG). Brian Gee was a member of the Scientific Instrument Society from its foundation in 1983. 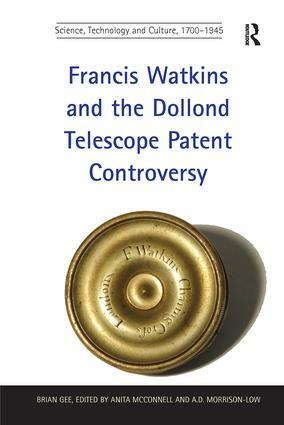 He published numerous key works on scientific instruments and had almost completed this monograph on the Dollond patent controversy before he died in 2009. Anita McConnell is an independent historian of science, living near Cambridge. A.D. Morrison-Low won the 2008 Paul Bunge Prize for her bookMaking Scientific Instruments in the Industrial Revolution (Aldershot: Ashgate, 2007). She is Principal Curator, Science, at National Museums Scotland. The completion of the book was made possible by the generous funding of the Scientific Instrument Society.